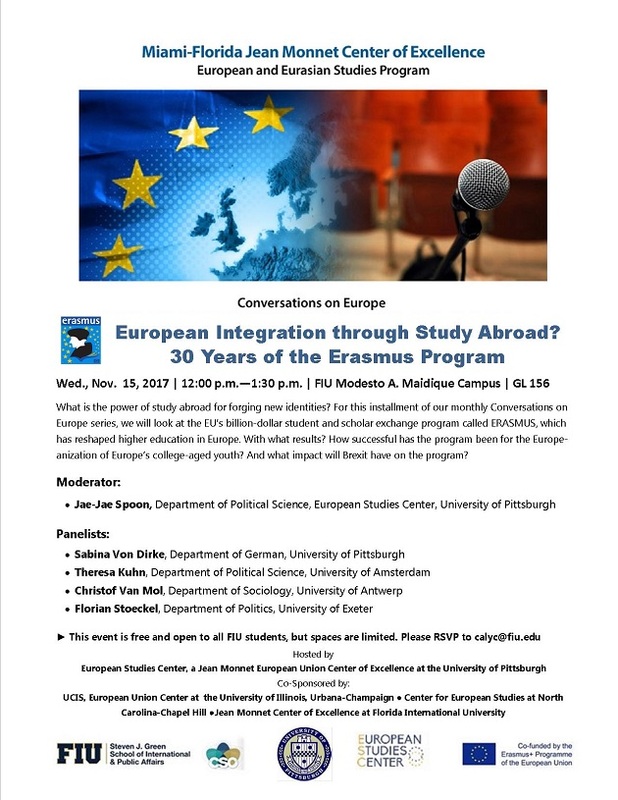 Conversations on Europe: "European Integration through Study Abroad?" Conversations On Europe connects top experts from around the United States and Europe to discuss contemporary issues facing Europe and the Transatlantic relationship. Using both personal and institutional videoconference technology, panelists take questions and interact with audiences at the University of Pittsburgh and at remote sites in the US and Europe. What is the power of study abroad for forging new identities? For this installment of our monthly Conversations on Europe series, we will look at the EU’s billion-dollar student and scholar exchange program called ERASMUS, which has reshaped higher education in Europe. With what results? How successful has the program been for the Europeanization of Europe’s college-aged youth? And what impact will Brexit have on the program?